The semi-finalists have been found at the 2016 OFC U-17 Women’s Championship after an action-packed Match Day 5 today in Rarotonga. Heading into the final day of group play every team had a mathematical chance of qualifying through, making for a tense afternoon of games which saw the two groups play simultaneously at Takitumu School and the CIFA Academy in Matavera. In Group A New Zealand and New Caledonia advanced to the semi-finals without a problem, both claiming comfortable victories – New Zealand 13-0 over Tonga and 5-0 for New Caledonia over Samoa. Group B wasn’t so straight forward as host nation the Cook Islands sprung the surprise of the tournament to date by defeating Vanuatu 5-1. That result knocked Vanuatu out of semi-final contention and opened the door for Fiji to qualify with their 2-2 draw against Papua New Guinea. New Zealand now face Fiji in the first semi-final, while Papua New Guinea face off with New Caledonia in the second. Both matches will be played at the CIFA Academy on 21 January. For New Zealand the result was never in doubt, scoring in the fifth minute via striker Hannah Blake and never looking back. An eventual hat-trick to Blake and Samantha Tawharu, plus four successful strikes from Maggie Jenkins and a double to Emma Main made up the New Zealand rout. New Zealand dominated the majority of possession, but did have a period late in the second half where they struggled to make any progress through the Tonga line. Speaking after the match – which was New Zealand’s biggest win of the tournament so far – coach Gareth Turnbull says it was a good way to finish the group stage. “I am really happy to get that result and now head into the semi-finals with some form behind us,” Turnbull says. “This was a different type of challenge because Tonga came out with a very deep-set formation. Tonga coach Christian Koaneti says his team were always up against it, but that the future looks bright for Tonga at U-17 women’s level. “We always knew it would be tough. We decided to play a very defensive game and I am really proud of the girls,” Koaneti says. At the same time over at CIFA Academy New Caledonia efficiently disposed of Samoa 5-0 and guaranteed themselves a semi-final spot, setting up the victory with three first-half goals. Katinka Takamatsu opened the scoring, followed by a double to Jackie Pahoa inside the opening 45 minutes. Fourteen minutes into the second half Takamatsu scored again, and just a minute later New Caledonia could have taken the lead out even further when they were awarded a penalty, only for Mune Bako to push the spot kick just wide. Takamatsu secured her hat-trick in the 74th minute, ending the scoring at 5-0. Post-match New Caledonia coach Matthieu Delcroix took time to complement their opposition on the day. “I am feeling great and I hope the girls are too. The score doesn’t really reflect the game because it was pretty hard for us,” Delcroix says. “Samoa put pressure on and we were having difficulty with their playing style, but the girls did their job. Samoa technical advisor Scott Easthope was upbeat about the tournament, despite his team leaving without a victory. “They never stopped working, we never questioned how much effort they would put in, but we were just not quite good enough with the ball,” Easthope says. Over at Takitumu School in Group B action Fiji had to come back from one-goal deficits twice in their 2-2 draw with Papua New Guinea, with coach Yogendra Dutt commending his team for their spirit. “We did enough to get through which is a great achievement for us at our first tournament of this kind,” Dutt says. Papua New Guinea forward Belinda Giada opened the scoring on the half hour mark after running in behind the defensive line and finishing neatly in the corner. With the game flowing from end-to-end Fiji received some good fortune four minutes into the second period when Papua New Guinea scored an own goal to tie the game up at 1-all. When Anna Malara scored on 66 minutes – with a gentle dink over the falling Fiji keeper – Papua New Guinea reassumed the lead. But with seven minutes left in regulation time Fiji forward Cema Nasau stepped up to save the day for her country, netting to finish the game at 2-2. For Papua New Guinea coach Margaret Aka the result was disappointing, but still enough to ensure her team went through as the top qualifier from Group B. “It was a frustrating game in many ways for us. We didn’t defend as well as we could have and our attack was a little bit off,” Aka says. Over at the CIFA Academy the local crowd were treated to a special performance from the Cook Islands side, who marked their first win of the tournament in style by beating Vanuatu 5-1. Midfielder Moeroa Harmon scored a hat-trick inside 36 minutes, followed by goals to Nicola Marurai and Daimzel Rongokea seven minutes each side of half time. Vanuatu had their chances to get back into the match – namely two penalties which went unconverted – but for most of the match Cook Islands defended strongly and took advantage of their opportunities on attack, with coach Tuka Tisam relieved to give the home crowd something to cheer about. 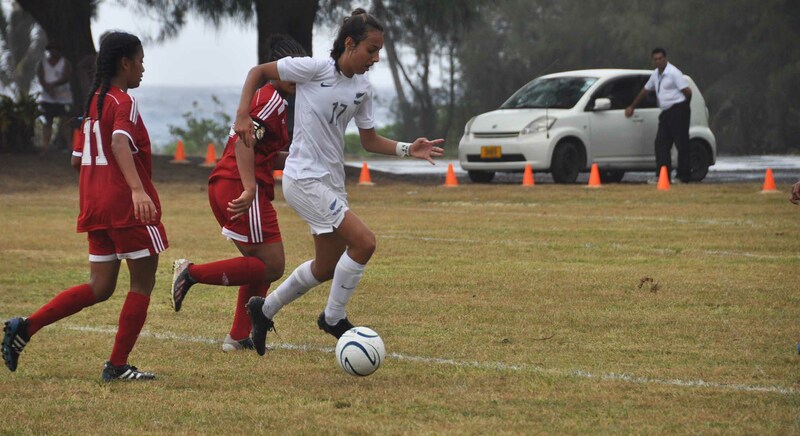 “This is absolutely going to prove positive for women’s football development in the Cook Islands going forward, for these girls in the team in particular,” Tisam says. Meanwhile Vanuatu coach Joel Rarua was left to ponder missed opportunities, which ultimately saw his team fall short of advancing past the group stage in Rarotonga. “You could see them try to play, they tried to get possession of the ball, especially from our half to the other side, but the finishing was really weak. The girls couldn’t break through the back four,” Rarua says. The semi-finals for the 2016 OFC U1-7 Women’s Championship commence on 21 January.